Stephanie Edgar Reeves first commissioned a series of drawings of Extraordinary Chickens in 2004. 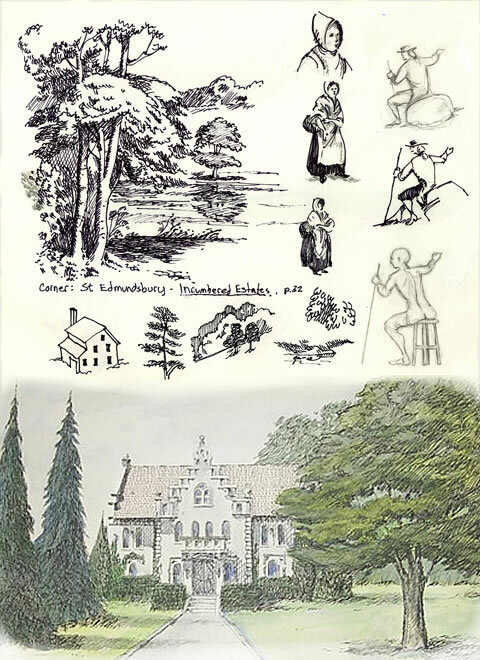 After that the Atlanta designer wanted 10 drawings of stately houses made to somewhat resemble lithographs found in Illustrated Incumbered Estates/Ireland, 1850 - 1905. The sketchbook page shown here gives examples of preparation studies. Building styles were chosen from photographs found in a book, Building for the Ages/Omaha's Architectural Landmarks. 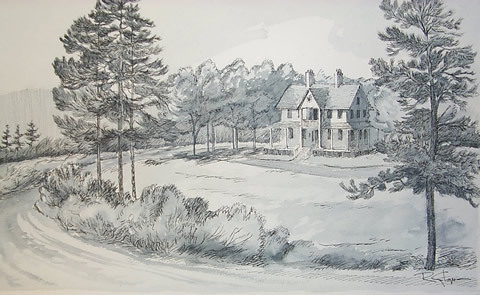 A similar watercolor/pen and ink drawing of a house and pine trees is below the sketchbook page.